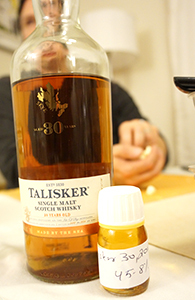 I think I’ve mentioned before that I’ve not generally been a fan of Diageo’s “Distiller’s Edition” series which sees the standard expressions of their so-called “classic malts” finished for a period of a few months in some kind of wine cask or the other. Most of these are sherry finishes, but there are some exceptions (the Caol Ila 12 gets a moscatel finish and the Cragganmore 12 gets a port finish). The only one I’ve consistently liked a lot is the Lagavulin D.E, which is finished in sticky PX casks which play surprisingly well with the classic Lagavulin 16 notes. 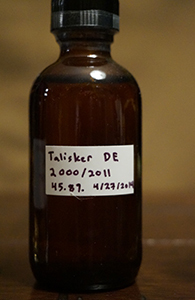 The Talisker D.E—finished in Amoroso sherry casks—I’ve been up and down on. I’ve liked some but with most have found the finish to cause the quintessential distillery character to regress to a sherried mean (which has also been my complaint with most of the others in the series). At least that’s what I though it in my “younger” days as a whisky geek, when I was more inclined to religious positions in these matters. Let’s see what I make of it now (I haven’t had one of these in a while).